After experiencing the humble might, majesty, and wonder of the Gus Burger at The White Spot, I was walking back to my car when I passed a bar called Boylan Heights. Normally I would have ignored the “Dead Poets Society” kitsch and kept going, but I noticed a small sticker on the front door. Apparently, in the past year or so, Boylan Heights had been voted to have Charlottesville’s best burger. Curious to see for myself, I decided to come back as soon as possible. The next day, while recovering from the hilarity and excess of a rehearsal dinner, I found parking off West Main Street and proceeded to Boylan Heights for a burger revival. Thankfully, it was a Saturday, each tv was showing a college football game, and even 1000 miles from home, the SEC was in full representation with the MSU game on two tvs above the bar. Once I had secured a giant glass of water, I scanned through the menu to find the best litmus test burger. 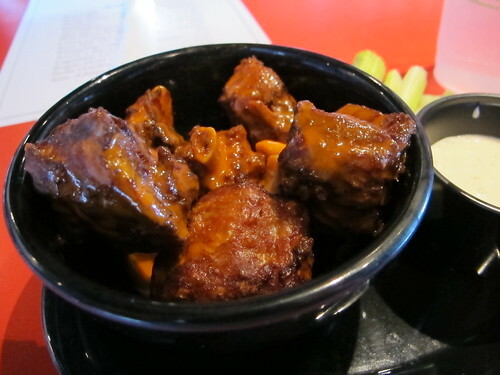 However, I was sidetracked by the words “pork wings”. Labeled as “When Pigs Fly….”, it was too much to pass a pork interpretation of the classic buffalo wing. Served with a side of ranch, these fire sauce drench pork spare ribs were everything I expected them to be. A few ribs needed a little extra effort to chew, while others were fall off the bone tender, either way it’s fried pork covered in a decently hot sauce, fantastic. Considering the amount of braising that was likely needed to make the ribs this tender, I can’t imagine the humble spare rib replacing the chicken wing anytime soon, but it’s a great alternative. Hoping to see just what sort of beef Boylan Height was using, I went straight for the heart of the matter with a simple cheeseburger. 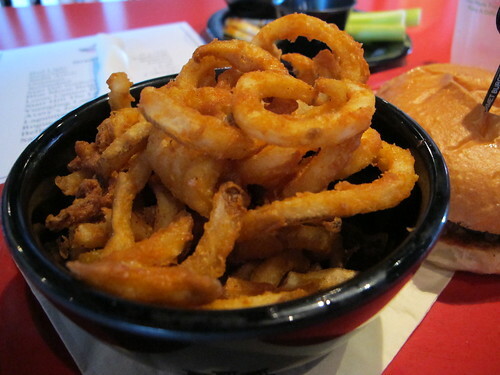 Served with a side of fries, the only thing missing was a side of bacon. There’s not much to say about Boylan Height’s fries. They’re curly, breaded, and fried to crisp perfection. Starting with a light, airy bun, a heavy slathering of mustard & ketchup, and finishing with well melted cheese, it was obvious that I should have gotten a double patty burger. It was only after my meal arrived that I noticed burgers could be cooked to order. 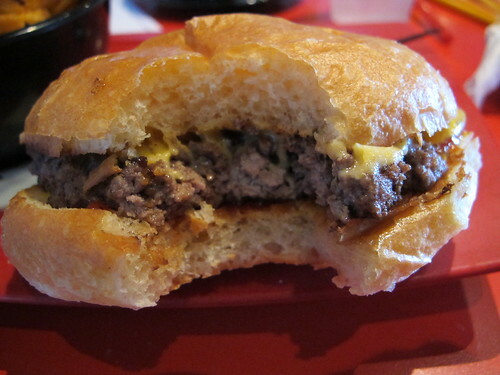 While I would have preferred medium rare, the medium well patty made for a simple, beefy burger. 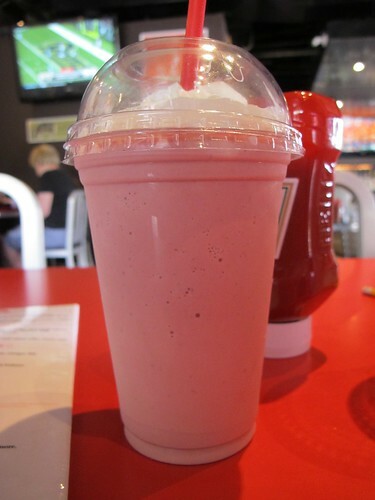 Although the pork wings and burger were more than enough for lunch, I couldn’t get my mind off the idea of a red velvet milkshake. Vanilla ice cream with real red velvet cake, cream cheese, and cocoa, there’s no way around it, it looked like a tall glass of pepto bismol. While the looks weren’t that appealing, the taste was pure red velvet cake and ice cream with just a touch of cocoa. This milkshake was as rich as it sounds and impossible to finish. 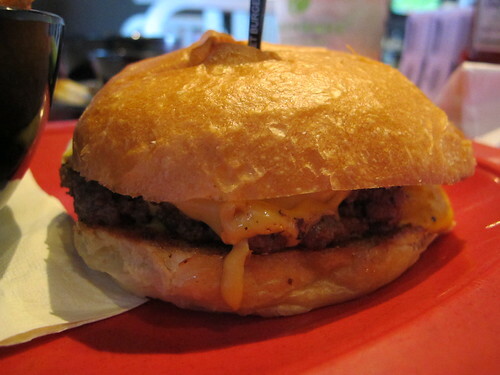 Does Boylan Heights serve the best burger in Charlottesville? With so little time spent in the city, I have no real basis to form a comparison. 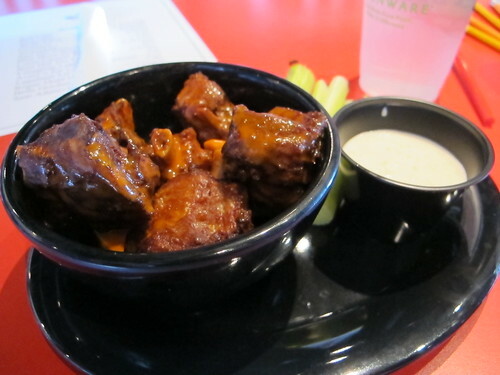 What I do know is that Boylan Heights serves a quality burger and some pretty damn tasty pork wings. I do wish I had ordered a double patty on my cheeseburger, but after walking away satisfied, I’d call it a minor quibble. 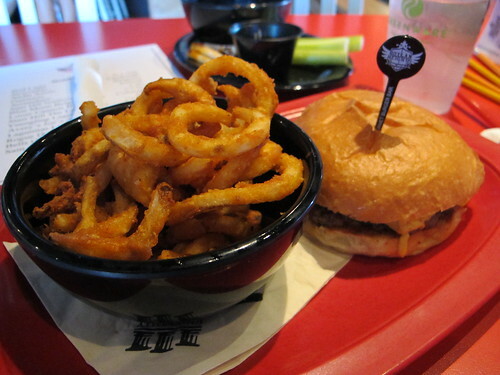 Boylan Heights, a quality burger and worth a look, just make sure to have that double cooked to order.